Toilet litter is now available in many forms. Some cats are only happy with one type but whatever you use you must be sure that you keep it clean. 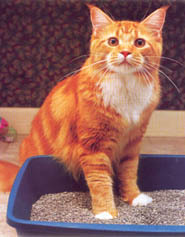 Cats by nature are fastidious (one of the reasons we keep them as pets) and they will refuse to use a dirty litter box. Clean it twice a day. Perhaps have two - one always out in the sun freshening up and drying. In a multicat household a number of trays is preferred.The main behavioural problem is inappropriate urination and defecation. Some litters have a second use on the garden, i.e. lucerne, paper pellets or poultry laying pellets. Emergency litter can be sand or soil from the garden. These are very useful when training an outdoor cat to begin indoor living.